Temperatures have totally dropped this week; there's a chill in the air and it smells like Fall -- time to pack away my sandals and break out the boots (honestly not sure if that terrifies me or excites me). Colder temps have me craving warm, comforting breakfasts. On a good week, I'll motivate myself to make toasted oats, or maybe even baked oatmeal, but sometimes, all I want is warm fruit and granola. 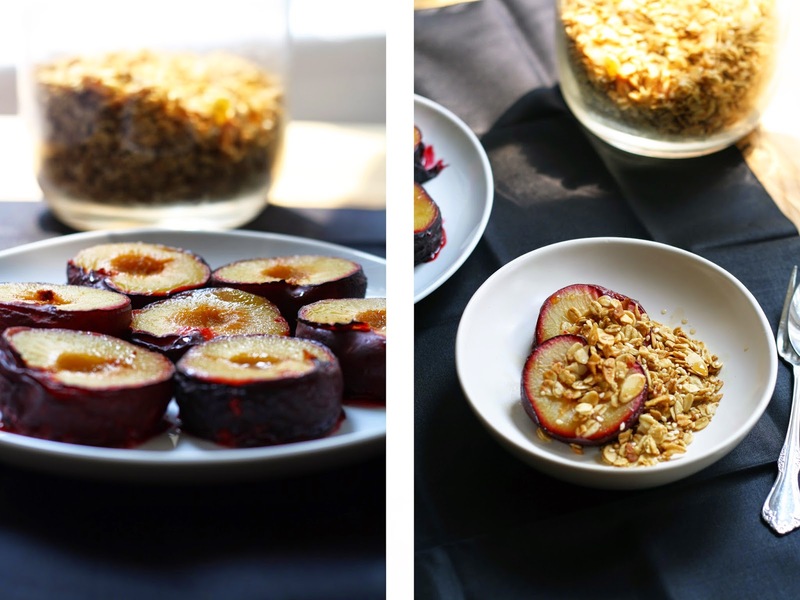 This recipe swings all the ways -- breakfast, mid day snack or dessert -- the plums can easily be reheated throughout the week, and are complimented beautifully with yogurt or ice cream. Ontario stone fruit is still abundant at the market, but if you can't find good plums, try apple compote instead, I imagine it would be equally satisfying and hearty. Toss all the dry ingredients in a large bowl. In a separate bowl, whisk the remaining ingredients. Pour the wet over the dry and mix to evenly coat all the oats. Spread onto a parchment lined baking sheet and bake for about 10-20 minutes, rotating halfway through, until golden brown. Allow to cool before serving. Place the plum halves on an aluminum foil lined baking sheet. Combine the maple syrup, vanilla and ginger in a small bowl and whisk to eliminate any clumps. Brush the plums with syrup, allowing a small pool to form where the pit was, yet conserving some of the liquid for serving. Roast for 25 minutes, with an optional extra 2-5 minutes on broil. Serve the plums warm, with a smattering of oats, a drizzle of leftover syrup, and an optional scoop of vanilla ice cream or yogurt.